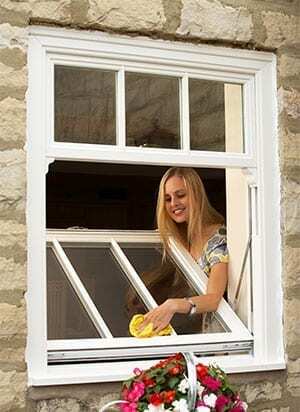 Home » Blog » How to clean PVCu Sliding Sash Windows. All our PVCu Sliding Sash Windows from Quickslide come with an easy clean tilt facility as standard. When cleaning your windows at home you are likely to be facing a burdensome task, especially when you need to clean the windows on the upper floors. Therefore, many people usually have their windows cleaned by a professional window cleaner costing somewhat around Twenty Pounds each time. With our Sliding Sash Windows, you could save this money as you would be able to clean every window from inside your home yourself. Each sash has both a tilt and slide facility allowing you to reach all sections of the window. When cleaning your sash or aluminium windows, you should not use any harsh products such as bleach or nail varnish to get any marks off as it could scratch or warp the frames and/or glass. Quickslide recommends using a clean cloth together with a non-coarse neutral solution such as washing up liquid mixed with hot water. This will get the marks off and prevent your windows from any damage. Slide the bottom sash up to the top sash and tilt by pulling the knobs into the sash. Lock the window in place by pulling the window towards you. Slide the top sash down and tilt towards you to lock into place. Using a cloth and soapy water, wipe the frame and glass from top to bottom. Close the windows and check all is clean. For any more information on how to clean sash windows talk to our Customer Service team on 0844 5610 623.